One of Carlton’s stars of the 1950’s, Johnny Chick was a talented wingman from Tasmania who forged a fine playing career in nine seasons at Princes Park. Determined and durable, he was a remarkably consistent performer, and won All Australian honours at the peak of his career in 1956. Chick came to the Blues’ notice after starring for New Town in their 1951 TANFL Grand Final demolition of North Hobart. The very next year, the 19 year-old was at Princes Park, where he took a season or two to establish himself in Carlton’s senior side, but then became a crowd favourite. In the number 23 guernsey previously worn by the great Bert Deacon, Chick finished among the top five in the votes for Carlton’s Best and Fairest each year between 1954 and 1957. In 1956, he represented Victoria in the ANFC Carnival in Perth, where his influence in a dominant VFL side was recognised when he was selected in the All Australian team. In round 17, 1957, during a fiery encounter against Fitzroy at Princes Park, Johnny clashed with Fitzroy’s Wally Clark. He was reported by the field umpire, found guilty, and suspended for a whopping eight matches. A fortnight later, he was sorely missed as Carlton was well-beaten by Hawthorn in the first Semi Final. Chick waited two more seasons for his first crack at finals football, but when it came at last in 1959, the Blues were found wanting. Having gained the double chance by finishing in second place on the ladder behind Melbourne, a ragged Carlton team lost to the Demons and Essendon in succession, to be bundled out in straight sets. Chick served as vice-captain to Bruce Comben in his final two seasons, playing the last of 119 games for the club in a 19-point win over South Melbourne at the Lake Oval in round 18, 1960. In 1961 he returned to Tasmania to captain-coach New Town - by then renamed Glenorchy – and lifted the Magpies into a Grand Final in his first year. 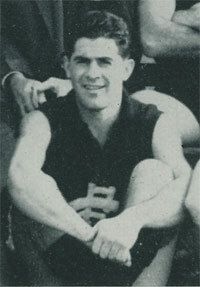 Chick retired from the field in 1963, but maintained a close association with Tasmanian football for the next 20 years. His last coaching appointment ended in 1980, after two seasons at the helm of the North Hobart Demons. In the year 2000, Chick was selected as a reserve in the Glenorchy Magpies’ Team of the Century. The Launceston Examiner May 2 1885, published team lists for a practice match between the City first twenty and the next twenty-five. In the 31 players listed for "next twenty-five team" was a H. Chick. H. Chick appears in a 1887 South Launceston team photo. A relation of John Chick? Contributors to this page: molsey , PatsFitztrick , Bombasheldon , blueycarlton , WillowBlue , pblue , p(12)terg , true_blue24 , Jarusa and admin . Page last modified on Thursday 21 of March, 2013 11:37:15 AEDT by molsey. 1969 Rd 6 - Robert Walls & Barry Gill chase after the footy.